Ms. Rice holds an Honors Bachelor’s Degree in English Literature and Writing from the University of Iowa; famous for its English programs. At Iowa she participated in the Undergraduate Creative Writing Track and held a 4.11 English courses GPA. Her hometown is Prairie Village, Kansas, and she was a lifer (k-12) at the Pembroke Hill School where she is also a substitute teacher in the Upper School English Department and a presenter in the Middle School. In 2013 she returned to Kansas after living in Japan for three years. In Japan, she taught in both conversation schools and high schools in Kanagawa Prefecture. Ms. Rice currently provides tutoring services, standardized test prep, small group and individual English classes, editing and writing services, home school education, Reading Plus guidance and English language coaching. Lessons use a variety of high-quality materials and are customized to students’ needs. 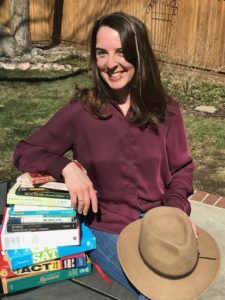 “Lindsay was essential in helping our daughter organize her time, develop study strategies and write essays in high school. Today our daughter is in her second year in college. Her freshman year, she was thrilled with her college courses but she found the expectations challenging. She learned quickly college professors assume you’re able to complete assignments and that you’ll seek support if you’re not. The sudden independence was frightening.